Synopsis: Refusing to believe that his son is dead, Judge Mathew Deacon travels across the Atlantic to Cambridge to search for evidence of his son's fate. However when his enquiries take him to the isolated homestead of the Northcotts, he discovers the real circumstances behind his son's sudden disappearance - and the secrets which have permeated the Northcott family for generations. THE CAST - Matthew Deacon: Neil Summerville - Mrs Northcott: Fenella Fielding - Prof. Forrester: Ian Brooker - Nicholas: Daniel King - Sybil: Kiki Kendrik - Griffin: Luke Harris - Dorothy: Laura James. Directed & Produced by Dexter O'Neill. 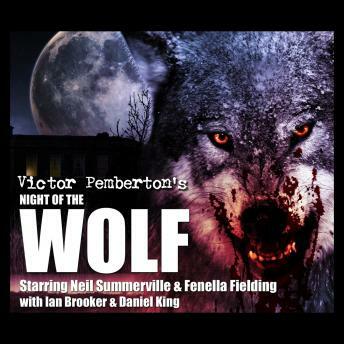 http://www.victorpemberton.com/radio 'NIGHT OF THE WOLF' (1984) - An original ninety minute gothic horror play about a werewolf on the loose in the Fenlands of East Anglia. Originally commissioned as a starring vehicle for the American film actor, James Stewart, but eventually starring Vincent Price and his wife Coral Browne. For SATURDAY NIGHT THEATRE, and subsequent BBC audio tape.